Panasonic will launch its Viera Cast technology in Europe during the coming months. We first heard tell of the tech last year and saw it at CES, but Panasonic has demonstrated it properly at the Panasonic Convention in Amsterdam and confirmed its Euro launch. 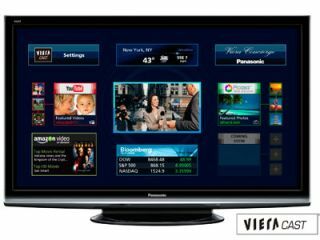 The service is already live in the US and enables you to access content though your TV via a built-in Ethernet connection. Among the content on offer is YouTube video and photos from Google's Picassa web galleries as well as on-demand streams from Eurosport and Bloomberg. You'll be able to view news and weather widgets from the web, too. In terms of hardware, Panasonic has given the Z1, V10 and the G15 series their European launch in Amsterdam. Apart from the lower end models, all these product lines will come with the Viera Cast feature. The tech is also built into Panasonic's new Blu-ray player line. Viera Cast TVs are also DLNA compatible. In case you don't know about DLNA, it's a standard for streaming media tech pioneered by several tech companies including Microsoft. Basically anything with a DLNA logo on it should take streaming media over a wireless or wired network without issue – including from a network storage device, so you don't even need a PC to stream downloaded content. It works rather like Apple TV or Netgear's EVA Digital Entertainer line (the latter is, itself, DLNA compliant). The only disadvantage with Viera Cast is that the tech only works with certain media formats at the moment - H.264 specifically, with the Z1 also being able to playback DivX.